James O’Connor farms at Ballytigue near Bruree in Co. Limerick. He is a Teagasc client and an active member of his local farm discussion group. The O’Connor family supply Kerry Coop with milk and have now moved to a 100% spring calving herd. Their herd was originally based on Dutch Holstein genetics but James wanted to reduce cow size and the cows are now mainly a mixture of Friesian, Kiwi and Jersey crossbreds. Average yield is 1100 gallons pa and the long term breeding plan is to improve milk yields, milk solids and fertility. 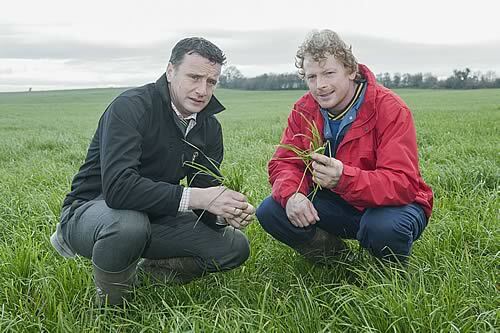 Dermot Campion of Germinal Seeds discussing early grazing with James O’Connor Photo by Fergal O’Gorman. This increase in milk yields and solids will come from growing extra grass and having it available early in the year. At present there are 240 cows on 180 acres of land so the stocking rate is quite high. Cows are normally out from February 1st and to facilitate grazing management and to minimise damage to paddocks three foot cow tracks have been installed. James says that for early spring grazing to work well you need a good infrastructure and lots of grass available on dry ground. On this farm 100 acres is considered to be dry ground and to optimise grassland production paddocks are reseeded in April or September with a Germinal tetraploid hybrid ryegrass grass seed mixture supplied by his local Coop store in Charleville. Since 2011 around 30 acres has been reseeded with AberEcho and AberEve and James is delighted with the results. “Farmers were stopping during the forage crisis of spring 2013 to admire the crop of grass and ask me what variety it was.” He plans to reseed another 90 to 100 acres with these hybrids. “We got good winter growth over the last two years so we had early grass in the spring for our cows and during the summer you can graze the paddocks every 14 days” according to James. The first two fields were rotavated, reseeded and rolled. The other fields were ploughed. According to James another option for him was to reseed after taking a silage cut. “You can spray with glycophosphate, stitch in the grass seeds after harvesting the silage and spread a cover of slurry. This works well and is very cost effective. ”You have to watch the weather for best results and it is essential that the soil has adequate P, K and lime. “These hybrids have to be reseeded more frequently than conventional grass seed mixtures but it’s a good investment says James who is delighted with the results. According to Dermot Campion from Germinal Seeds a hybrid ryegrass such as AberEcho or AberEve lasts for four years or more and yields nearly the same as Italian ryegrass. The hybrid is a cross of Italian and perennial so it provides farmers with a high yields and is more persistent. During the growing season, hybrids behave in a similar way to Italian ryegrass up to flowering, after which there is a change in growth form towards that of perennial ryegrass to produce a leafy re-growth in the mid-season, which increases nutritive value and promotes persistency.